Well up to the high standard of the Binchois Consort’s earlier releases. English visitors to the Musée Cluny in Paris can be surprised to see its massive collection of Nottingham alabaster from the 14th and 15th centuries. Like the English music that was so widely distributed on the continental mainland in the 15th century, it was plainly loved and respected throughout Europe but most traces of it in England were destroyed on the instructions of Henry VIII, Edward VI and Oliver Cromwell. So Andrew Kirkman and Philip Weller obviously had a good idea when they decided to base a CD (and a project) on the similar cases of the two. The accompanying booklet here is generously decorated with beautiful colour plates of English alabaster (though they are so reduced in the printed booklet that you will need to go to the Hyperion website to see them properly and even to decipher the gushing commentaries on the sculptures). Thankfully, the scholars have more sense than to draw precise parallels between any particular piece of music and a particular sculpture. And don’t be put off by the first page of the notes (almost any paragraph of which could earn a place in ‘Pseuds’ Corner’). The fact of the matter is that the two repertories share almost nothing apart from their similar reception histories. But the six adult male singers of The Binchois Consort under Andrew Kirkman perform on a very high qualitative level indeed. There are two excellent earlier recordings of Frye’s Mass Flos regalis but The Binchois Consort may well come closer than their predecessors to the true spirit of the work, particularly in terms of personnel and pacing. And if there is occasionally a certain sameness between the tracks, they do jump out at you in a thoroughly spirited performance of John Plummer’s evergreen Anna mater. This recording comes out of a collaboration between the Binchois Consort and the Castle Museum, Nottingham. The detailed notes include a wide range of photos of medieval alabaster carvings which reflect the music and life of the period. The notes are detailed and the translations are precise for each item. This alone makes it something of a rarity when notes can be skimped or often non-existent. To this one must note the fine recording itself and the close relationship between music, text and image. A very welcome recording of works by Alanus, Dunstable, Forest and Power plus anonymous items. Along with the Hilliard Ensemble and Gothic Voices, The Orlando and The Binchois Consorts have devoted a substantial proportion of their discographies to the music of the later English Middle Ages. That further offerings from them both should appear within a month of each other is cause for celebration, especially when so much is either new to the catalogue (on The Orlandos’ disc especially) or presents some of the repertory’s best-known pieces in a new light (The Binchois Consort). Although there is some chronological overlap between the two recitals, the only actual duplication concerns the ‘singers’ motet’ Sub Arturo plebs, whose date of composition has recently been revised, bringing it into the orbit of the victor of Agincourt. The Orlandos’ disc, which covers some 150 years or so, is stylistically the more diverse. That follows logically but is compounded by the inclusion of some truly bizarre pieces that seem only marginally less weird in performance than on paper. The Kyrie Cuthberte is one; others include the Mass movements by Leonel Power at his more enigmatic. The Orlandos sensibly espouse the music’s rough edges (as in the Kyrie Cuthberte), courting roughness themselves in a good cause. Where a more mellifluous tone is required, as in the top-voice-driven Credo by Excetre, they give Matthew Venner’s expressive countertenor full rein. In general, the simpler chordal pieces are the most effective; the more intricate isorhythmic pieces are more uneven, in that the tenor part has not quite the solidity to anchor the interplay of the free voices above it, while the startling turns of Power’s Credo might easily have packed more of a punch. The Dunstaple set provides an island of relative familiarity before two anonymous Credos round off the recital. In the second of these, the only four-voice piece of the disc, The Orlandos throw off the tentativeness occasionally discernible elsewhere and revel in its intricate textures. 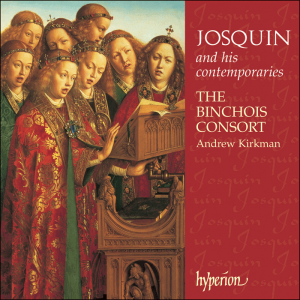 The Binchois Consort’s recital is more focused chronologically, dwelling on the brief reign of Henry V and the boyhood of his unhappy successor (in that sense this new disc is a close companion and sequel to their previous offering – Hyperion, A/11). Its account of Sub Arturo plebs is more surefooted than The Orlandos’, and in general they differentiate nicely between the different styles and registers. The rollicking Agincourt Carol sounds less pugnacious than from Gothic Voices all those years ago, more an outgoing expression of grateful thanksgiving; the two isorhythmic motets by Forest are as melodically felicitous as anything by Dunstaple, who himself is represented by works of the first importance: Preco prehiminencie and Veni Sancte/Veni Creator both featured in the Hilliard’s marvellous anthology (and on a subsequent, scarcely less fine one from The Orlandos). The Binchois take both at a higher pitch and dispense with the doubled tenors that cast such a spell in the Hilliard anthology; as one steps out of its shadow, the virtues of Kirkman’s approach reveal themselves (the tweaking of tempos for the middle sections is particularly effective). Two anonymous motets in honour of St Thomas Becket are a seeming throwback to an earlier period, and are followed by three surviving movements of what must have been a complete Dunstaple Mass cycle (one of which has undergone substantial restoration). The concentration of Dunstaple’s music is one of the disc’s high points, worth the price of admission on its own: the second section of the Kyrie in particular shows off the understated eloquence of both composer and ensemble. See here for a concert review in La Republica and here for photos of rehearsals and concert. The Binchois Consort’s new album is in part an exploration of the polyphonic tradition of 15th-century English church music, and in part an examination of the relationship between religion and politics in the decades following the battle of Agincourt. Much of the music is associated with John of Bridlington, patron saint of the Lancastrian monarchy and the last Englishman to be canonised before the Reformation. The main work is the anonymous Mass Quem Malignus Spiritus, which takes its name and thematic material from a chant written in the saint’s honour. It’s found in the Wollaton Antiphonal, one of the great, late-medieval illuminated manuscripts, and source of many of the chants and motets interwoven within the Mass’s movements. It’s subtle, beautiful stuff and no one would doubt its spiritual sincerity. But allusions to John, who seemingly had the power to drive out spirits, are never far from the surface. At a couple of points, he is aligned with the national warrior saint, St George, of whom the warrior king, Henry V, was also fond. One piece, a setting of the Gloria, is ascribed to “Roy Henry”, reckoned to be the king himself; he was quite a composer, if this is anything to go by. The performances are faultless. A few issues back I reviewed a new release by Stimmwerck devoted to the St. Emmeram Mensural Codex (Aeolus 10023), part of the celebrations surrounding a symposium on the manuscript that is currently held at the Bavarian State Library. This disc takes its start from similar recent events surrounding the Wollaton Antiphonal, compiled for the extremely wealthy and zealously Lancastrian Sir Thomas Chaworth in the first half of the 15th century. Numerous selections were added from the Old Hall Manuscript, as it is now known, to provide a greater range of sacred music particular to the chapels of Henry V and Henry VI. The result is an overview of several sacred musical styles fostered by the Lancasterian princes during the early 15th century, shortly before the pan-consonant approach often associated with Dunstable became more common. The Missa Quem malignus spiritus is based on a responsory chant (also included on the disc) that the Wollaton Antiphonal preserves from the Bridlington Office. The anonymous three-voiced Mass supplies the virtues of clarity, inventive imitation, and clever rhythmic interplay between its two upper parts. Interspersed around its movements is a fascinating variety of roughly contemporaneous material. There’s the polished Ave regina caelorum a 4 by Walter Frye—possibly a contrafactum, derived from a now-lost secular ballade—and the chant Asperges me , with faburden (second voice a fifth below the plainchant) applied to excellent effect. John Cooke’s combinative motet Alma proles/Christi miles sings across the ages with its vigor—presumably celebrating one of Henry V’s military victories—while the Gloria by “Roy Henry,” who was Henry IV, Henry V, or someone else, is competent in its handling of textures. Pride of place, though, must be given to two four-voiced motets by Leonel Power, displaying his typically rich triadic approach, a lack of concern with standard mensuration, and asymmetrical phrasing. The effervescent Ave regina caelorum with its English discant style is probably the earlier of the two, as it demonstrates a level of dissonance between voices that was toned down in his later work. Both pieces are inordinately inventive, and as is often the case with extremely fine music, seems to pack more content into a short duration than logically should fit. The performances are typical of the six-voiced Binchois Consort: perfect intonation, great clarity between the parts, excellent enunciation, and a more full-blooded exuberance (where required) in this music than is standard in some other British early-music vocal ensembles. Andrew Kirkman’s ear for phrasing and blend is everywhere evident. The venue is perfect, possessing just enough churchly reverberation to let the voices bloom, with none of the cavernous effect that exaggerates lower frequencies and dulls the boundaries between vocal lines. In short, highly recommended. See here for reviews by BBC Music Magazine, Diapason, Gramophone, The Observer, and The Times. Guillaume Dufay’s Missa Se la face ay pale, composed in the 1450s, is a milestone of music history by any standard. It was one of the first complete mass settings, including all five sections of the Ordinary, and it represented a major leap forward in terms of harnessing the expressive possibilities of the form. The polyphonic chanson Se la face ay pale (If my face is pale) on which it is based, also by Dufay, can generate momentum in several directions depending on its polyphonic treatment, and its tenor part is repeated as a cantus firmus and progressively sped up over the course of the mass, creating a simple but effective large-scale architecture. Further, Dufay was arguably music’s first international star, hired to bring glory to the court of the Duchy of Savoy in what is now northwestern Italy; the pattern of bringing in prestigious musicians to adorn powerful states or other institutions has come down in one form or another to the present day. Both the mass and its place in early Renaissance society are expertly laid out in the booklet notes by Philip Weller, which appear in English, German, and French, although the Latin texts of the music are translated into English only. The performance by the Binchois Consort, with eight adult male singers, is superb. The group negotiates the challenges of paired voices, with exquisite control over vibrato; the singers convey something of the intensity the music had in its own time, and they carve out the significant details of the music: the expressive vertical sonorities, the modulation of contrapuntal complexity and simplicity that works in tandem with the cantus firmus line and it is these factors that are obscured in “purer” recordings.” The singers reduce to quartets for some sections of the mass with lovely effect. The mass is not presented sequentially but intertwined with settings of a mass Proper connected with a local saint who was significant in the life of the Savoy court; these too furnish contrast with the mass music that would have kept things lively for congregants of the middle 15th century. The sound, recorded at the chapel of Oxford’s All Souls College, is a tour de force on the part of Hyperion’s engineers, who achieve maximum clarity in a difficult but rewarding environment. It is hard to imagine a better Renaissance mass recording. Royal weddings of the 15th century involved extravagant musical celebrations, and the 1468 marriage of Edward IV’s sister Margaret of York and Duke Charles the Bold of Burgundy was more extravagant than most. These pieces, from a manuscript embracing both English and Burgundian styles were probably performed as part of the festivities.England is represented by the Masses – one of them certainly, and one of them possibly by Walter Frye. These are characterised by brisk word setting, rather angular melodic lines, and vigorous, heavy syncopated rhythms that give the music a strong sense of forward movement. On the Burgundian side, the motets by and attributed to Busnois tend to have longer, more flowing lines, less strongly marked rythms and more complex moving texture.Thanks to the six excellent male voices, who take a special delight in Frye’s rhythmic exuberance, this is a particularly attractive issue. It is a perfect example of that all-too-rare high-quality musicianship which such fine but little-known early music needs if it is to win the wider appreciation it deserves. This is the second recording in a year to contain music from the manuscript known as ‘Brussels 5557′ (the first was from The Clerks’ Group on Signum). The manuscript is one of the most important sources of music from the fifteenth century, but sadly the music is rarely heard. However, whether by design or by chance, the repertory on the two discs does not overlap at all; so now, all at once, we have good recordings of four very significant Masses and some important ancillary works as well. And this is certainly a very fine disc. The music is always allowed to flow – it is easy for this repertory to sound static, especially the discant-style works – but here, in the Anonymous (?Frye) Missa Sine nomine the singers achieve a lovely feeling of movement. In the more mentally challenging Busnois pieces we, as listeners, are given some idea of the originality of the writing while still feeling that the performers know their way around the music. There is some fantastically agile singing here: one only has to listen to the tenor singing in Regina coeli II, where the range is almost as high as that of the uppermost (alto) voice, or to hear the ensemble work in the motet Incomprehensibilia firme to appreciate the quality of this performance. One of the benefits of academically informed recordings is that one gets to hear music that one might not ever otherwise encounter. The Brussels manuscript provides a good core of works, but it is also good to hear the double-texted motets on this disc, included because they have been attributed by modern scholars to Busnois. Both are wonderful works; and if the first does not sound very much like Busnois it is nonetheless a gorgeous piece, and one that I am very glad to have heard. Another benefit of scholarly recordings is that one can expect well-written and enlightening insert notes, and this booklet is no exception, with seven pages of notes packed with information (next stop: disc notes with bibliographies!). Another first-rate disc, then from Andrew Kirkman: this is a must for the ‘early music’ audience. 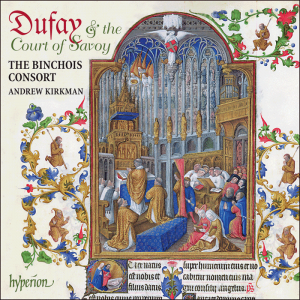 The Binchois Consort’s second recording of early works by Dufay is even better than the first. The highlight of the disc is another of Dufay’s pioneering Mass cycles, the for St James the Greater. The Binchois Consort gives a totally convincing performance of its disparate sections, which include the polyphonic settings of the Propers, preserved – unusually for the period – in one of the sources for the Mass. The accuracy in intonation (both in pitch and unanimity of vowel sound) makes for a harmonic-enriched vibrancy, well captured on the closely miked recording by Hyperion, and the refined balancing of the four voice parts (AATT) brings out Dufay’s inventive – often experimental – vocal writing to the full. As David Fallows pointed out, the tempos seem just right: nothing feels rushed, even where the flow of notes and rate of harmonic change – one of the distinctive features of Dufay’s music – are rapid. And there is space for expressive singing in response to the text, not only at the more obvious moments such as ‘ex virgine Maria’ in the Credo (which elicits some strikingly sustained singing), but also, more unexpectedly, in, for example, the ‘Amen’ of that section. The St James motets included on the CD offer further contrast to the range of styles encountered in the Mass. For whatever occasions these works were originally composed, those present must have been struck by their originality, and, if they were performed with anything like the richness of sonority and verve of The Binchois Consort, by the sheer technical bravura of a composer still at the start of his career. So utterly compelling is this recording that I can imagine it acquiring cult status, even without the saxophone; it is certainly an eminently worthy winner. 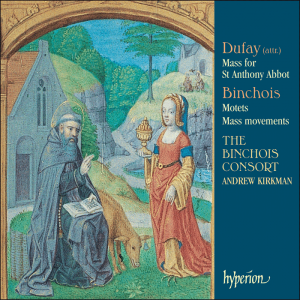 Obviously pride of place goes to Dufay’s Missa Sancti Jacobi and other early works, superbly performed by the Binchois Consort under Andrew Kirkman: all reviewers agreed that it sets new standards in the lucid presentation of this music; and the Mass itself, hitherto available only on a very old (if excellent) recording, has a place in any collection of the key music of the fifteenth century. This is Dufay as I have always wanted to hear him. 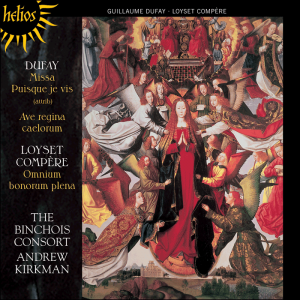 In what is only their second CD (the first was on Hyperion 6/96), The Binchois Consort show absolute mastery of Dufay’s difficult early style, with immaculate balance, wonderfully free phrasing, and crystalline clarity. Moreover in the Missa S jacobi Andrew Kirkman shows an uncanny ability to set the perfect tempo every time, so that the music emerges with its full force. The Missa S Jacobi is and odd but supremely important work. It is one of two early Dufay Mass cycles that have rarely been recorded, partly because they are less obviously part of a grand tradition than his later four-voice cantus firmus Masses. And this one is particularly difficult because its many different textures and styles present a severe challenge if it is not to seem fragmented and incoherent. Here it stands as a glorious masterpiece, its nine movements spanning over 40 minutes, with the various styles acting as necessary contrast and culminating in the famous Communion that Heinrich Besseler many years ago argued was the earliest example of fauxbourdon writing. Strangely, two of the motets work less well: both the earlier Rite majorem and the later Balsamus seem to go to fast for the details to have their full effect, perhaps because they are so strikingly different in style from the other works performed here. And it seems a touch perverse to use the now fashionable ‘old French’ pronunciation of Latin, particularly in a motet composed for a papal ceremony (even if the original singers would have been Franco-Flemish); In all his early motets the text seems centrally important, and this kind of pronunciation loses too many consonants. But the Italian-texted Apostolo glorioso is again quite superb, as is the Gloria and Credo pair. Briefly, then, this is as close to a perfect Dufay CD as I have heard. Few works embody the spirit of an age so eloquently as the L’homme arme Mass of Antoine Busnois. Simultaneously outgoing and hieratic, it encompasses all the expressive possibilities of its time and by juxtaposing them in all sorts of surprising ways pushes them further still. Teeming with incident, it encourages the listener from the off, but retains throughout a classical balance and poise. No other Mass of the mid-15th century survives in as many sources and no other setting of the famous tune was as influential. Busnois’ masterpiece has become one of the most discussed pieces in ‘early music’. This is largely due to Pro Cantione Antiqua’s magnificent recording, made in 1976 (unfortunately not presently available), which anticipated most scholarly evaluations. Although PCA’s account has aged remarkably well, the Binchois Consort improves on the older in several ways. PCA used a chamber organ for colla parte voice-doubling, and in the Agnus Dei they added a sackbut to reinforce the cantus firmus’s descent into the bass’s lowest reaches). This imparted an attractive sheen to the sound-image, but tended at times to overload the texture and obscure certain details (notably when the top line dipped into the middle of the texture). Kirkman’s a cappella approach resolves these problems, but with no loss of brilliance or sonic distinctive-ness. Some courageously close miking captures the slightly rough-edged grain of these voices; by allowing an element of risk into these performances, the singers (assisted by Hyperion’s production team) exhilarating replicate the balance of finely wrought detail and clarity of design that characterises the work itself. As so often in this repertory, the choice of tempo is paramount in determining the success of an interpretation. Bruno Turner understood this equally well, but the Agnus III Kirkman slows the basic tactus down just a notch: this dramatise one of the Mass’s most sublime moments, when the inverted cantus firmus is momentarily exposed, the basses holding a low F for several seconds with a lone, static voice for company. One of the Mass’s high-points, it ranks among the supreme inspirations of the 15th century. This example will stand for detail; to hear the ensemble’s (and Busnois’) sense of pacing at its best, try the second part of the Credo, which resonated with a compelling sense of calm and mystery. The Binchois Consort has never sounded more assured. I mentioned earlier the wealth of unrecorded polyphony from this period. Kirkman is always keen to introduce new works to the repertory, so its entirely fitting that he should couple Busnois with a composer virtually unknown today, but who appears to have had a formative influence on him. Until now, Domarto has been chiefly remembered as the bete noire of the theorist Johannes Tinctoris, who subjected him to scathing criticism; but his reasons for doing so have little to do with sound of Domarto’s music, and it is good to hear this at last. As Kirkman says, his Mass Spiritus almus is a gentler, less assertive work than Busnois’s, and it yields its beauties less readily. But beauties there undoubtedly are, and from a technical standpoint Domarto’s Mass is a perfect foil for its more extravagant counterpart. It allows the Binchois Consort to display a more contemplative side. The remaining motets are nicely varied , too. Anima mea liquifacta est is surprisingly rhapsodic by Busnois’ standards. Gaude celestis domina has only recently been identified as his work, but his stamp is unmistakable. Finally, Pullois’ Flos de spina is given a similarly involving rendition. This is musicianship of a very high order, transcending specialisms. But success has not gone to their heads. The consort remain strictly perennial, blooming once a year with a series of summer concerts and a recording. It’s a pattern largely determined by geography. While the singers are largely based in the UK, the director, Andrew Kirkman , now lives in New Jersey. ‘I return to England in the summer, we have some rehearsals and I try to base a recording around a concert series. So we’ll prepare the music for a concert and air it live, learn some lessons and then go into the church we use as a recording studio a week or so later’. Kirkman uses a pool of eight to ten singers, all of whom work with other choirs throughout much of the year. But he is adamant that as a group the Binchois Consort have their own distinctive sound. He puts this down to the way he shapes the music. ‘I pick pieces that I feel I can give a convincing interpretation of. We don’t really have much sense of how people performed this music at the time, and certainly not the nuances of medieval performance – the shaping and the phrasing. So we have to recreate this. I try to do it in a way that makes compelling sense to a musician today, after all these performances are for us in the hear and now. This is what I call ‘informed musician-ship’; my work on this music as a scholar forms a kind of sediment upon which I try to build something more spontaneous’. A leading light in 15th-century studies, Kirkman’s performances glint with cutting-edge scholarship. ‘At conferences I often mention that if anyone has come across any pieces which they think are really deserving they should send them to me. I like to be a conduit for other people’s research and at the same time bring the listening public something rare and exciting’. 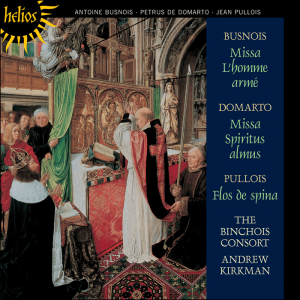 The Binchois Consort’s latest recording is based around two mid-15th-century masses: Antoine Busnois’s seldom-heard Missa L’homme arme, and the first recording of a work that helped shape it – the Missa Spiritus almus by the shadowy Petrus Domarto. Busnois Missa L’homme arme was one the most widely admired and emulated works of the 15th century, and possibly the earliest mass composed on the famous tune ‘beware the armed man’. Exceptionally for a composer of the period, Busnois’s music reveals a sense of self and a desire for personal expression. Violence among the clergy was surprisingly common during the middle ages, but kirkman still feels that this incident points to someone with a very strong personality who was certainly not shy of expressing himself. ‘There’s a powerful, emotional voice shouting out from the music, but a controlled one as well; it’s not a wayward voice, it’s harnessed and used in a very precise, intellectual way’. The signs are everywhere. At the end of the Credo there is an increase in rhythmic complexity to the point where there are different metres in each part all going on simultaneously. Extravagant and emotional gestures like this may seem at odds with our preconceptions about the medieval sound world, but we are listening to this music today with secular ears and an aesthetic sensibility. Kirkman thinks we should try putting ourselves in 15th-century shoes. ‘It was a matter of life and death to them. The Mass was the central article of faith and everyone believed that attendance was an essential part of building up “grace” so that one wouldn’t suffer too much purgatory after death’. In that light, Busnois’s Missa L’homme arme takes on a whole new meaning – maybe, in a different but no less dangerous age, we should all invest, for the sake of our eternal souls, in a copy.